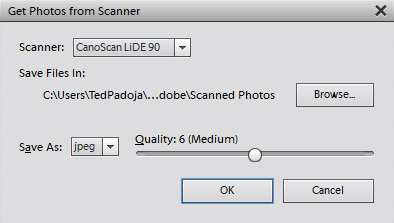 When you add photos to the Organizer in Photoshop Elements, the photos and any additional media appear as thumbnails in the central portion of the Organizer — known as the Media Browser. After files are imported into the Organizer, you see just those photos you imported in the Media Browser. Similarly, when you click a folder in the Import panel, only the photos within the selected folder display in the Media Browser. To see all the photos in your catalog, click the All Media button at the top of the Media Browser. The Import panel is the list of folders on the left. You can collapse the panel to provide more viewing area in the Media Browser. Just click the Hide Panel button in the lower-left corner of the Organizer workspace. Photos displayed in a Tree view in the Import panel. The Import panel offers two different views. List view: By default, you see the folder List view that shows all folders imported in alphabetical order. If you have photos in subfolders, the Folder List view doesn’t reflect the hierarchy for how your photos are organized on your hard drive. Tree view: To see a different view in the Organizer, click the drop-down menu and choose View as Tree, and you change the Import panel view to the hierarchy view. If you have a touchscreen monitor or device, you can swipe photos to view them one at a time. If you don’t see the details below the photos or the photos don’t appear in grid view, press Ctrl+D (⌘+D) to change the Media Browser view.